Pottermore is an interactive new Web site and reading experience with more than 18,000 new words from J.K. Rowling: Much more to come. JKR behind the scenes filming the video picture. An online experience to read, interact with and share the Harry Potter stories. Exclusive writing from J.K. Rowling and more. 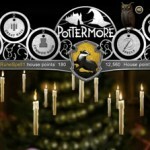 Pottermore will feature infromation J.K. Rowling has been “hoarding” for years about Harry Potter. Pottermore will be the exclusive place to purchase the digital audio books and, at last, eBooks of the Harry Potter series. Pottermore was also created in partnership with @sony! One million fans will get access to a beta on July 31, Harry’s birthday. It will be open for all in October 2011. The launch of Pottermore will have more than 18,000 words from J.K. Rowling, but that is only a third of what she has written so far. J.K. Rowling said this morning that there is a lot more content to come for the Pottermore site, and she will develop it as it grows. This morning J.K. Rowling said that she and Harry have a “casual relationship,” instead of the serious kind they once had. The idea came from a conv. with her agent about how to help Harry live on in today’s digital age. JKR downloaded eBooks for the 1st time this year and loved it – “a thousand books in your pocket” – tho she loves paper. You will follow the story, get sorted into a house and get a wand (one of 33,000 possible combinations) – all crafted by JKR. JKR said if you’re not sorted into Gryffindor you get even more exclusive content about your house. 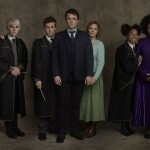 Chamber of Secrets story to debut in 2012. A physical encyclopedia may come one day, JKR said, but she is not positive. Also mentioned that Vernon ad Petunia met at work, backstory also on Pottermore. Scholastic is proud to be a key partner in the Pottermore project, including connecting teachers and parents from our school and online channels directly to ebook sales via Pottermore and providing marketing and promotion support. We’re excited about the new content from J.K. Rowling to go along with the books. This will surely inspire more interest in the series and bring a whole new generation of readers to Harry Potter. We’re pleased to support Pottermore because we know the power of the Harry Potter books to turn kids into lifelong readers, and we believe every child should experience Harry Potter ’ whether in ebooks or in print. In addition, Scholastic will receive a royalty on sales of the U.S. editions of the ebooks. You may have recently noticed a number of owls on various websites leading you to a YouTube film, where I have announced my latest, exciting piece of news. POTTERMORE is a new web site, where you can enjoy an online experience based around the Harry Potter books, which includes exclusive new information from me. If you would like to see the announcement film please click here. Whilst you’ll hear more from me on pottermore.com at the moment, jkrowling.com remains my own personal website for various content such as updated biography and bibliography, and links to relevant organisations, including the charities I support. The AP was on hand at the press conference this morning. Photos can be seen here. The owls continue to gather as the countdown ticks closer to the release of Harry Potter author J. K. Rowling’s anticipated announcement on Pottermore, her latest Harry Potter project. As we reported yesterday, press conference is said to be set for Victoria and Albert Museum this afternoon (UK time) regarding Ms. Rowling’s announcement. Leaky will have up to the minute updates on Pottermore so stay close! The announcement today was heralded by the revealing of the website’s name via an online search for its letters, and a ˜coming soon’ holding page which received over a million visits within 36 hours of launching. For this groundbreaking collaborative project, J.K. Rowling has written extensive new material about the characters, places and objects in the much-loved stories, which will inform, inspire and entertain readers as they journey through the storylines of the books. Pottermore will later incorporate an online shop where people can purchase exclusively the long-awaited Harry Potter eBooks, in partnership with J.K. Rowling’s publishers worldwide, and is ultimately intended to become an online reading experience, extending the relevance of Harry Potter to new generations of readers, while still appealing to existing fans. As the Pottermore Shop develops, it is intended that it should include further products designed specifically for Harry Potter fans, offering a potential outlet for Sony products and services related to Pottermore. In keeping with Harry Potter’s international appeal, the site will launch in English, French, Italian, German and Spanish, with more languages to follow. In the new website, the storyline will be brought to life with sumptuous newly-commissioned illustrations and interactive ˜Moments’ through which you can navigate, starting with the first book, Harry Potter and the Philosopher’s (Sorcerer’s) Stone. On entering, you choose a magic username and begin your experience. As you move through the chapters, you can read and share exclusive writing from J.K. Rowling, and, just as Harry joins Hogwarts, so can you. You visit Diagon Alley, get sorted into a house, cast spells and mix potions to help your house compete for the House Cup. At a press conference at the Victoria & Albert Museum in London, Rowling revealed some key features of the website. 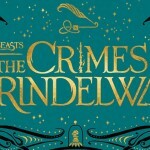 In an announcement which will thrill fans, she described how she has brought to life both the Sorting Hat and Ollivanders experiences from her books for the first time on Pottermore, by revealing the questions asked by the Sorting Hat – which places newcomers into their Hogwarts houses according to their characteristics – and the magic behind the Wand Chooser ’ which finds the right wand for each user from over 33,000 possible combinations. She also revealed glimpses of the new information she has provided on some of the best-loved characters.